A 2010 photo shows thick oil from the BP Deepwater Horizon oil spill floating on the surface of the water in Bay Jimmy, Louisiana. Japanese conglomerate Mitsui will pay $90 million for its role in the Deepwater Horizon disaster, the worst oil spill in US history, authorities said. Japanese conglomerate Mitsui will pay $90 million for its role in the Deepwater Horizon disaster, the worst oil spill in US history, authorities said Friday. Mitsui will pay $70 million in civil fines, the largest penalty to date under the Clean Water Act, to resolve alleged violations of the law, the Justice Department said in a statement. It has also agreed to spend $20 million for Gulf conservation projects, including land purchases in several states on the Gulf coast. 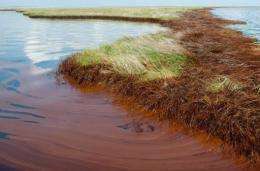 The settlement will be paid by a subsidiary of Mitsui, MOEX Offshore, which teamed up in 2007 with British giant BP in a Gulf of Mexico exploration project that produced the massive oil spill. MOEX had a 10 percent stake in the Macondo Well, which blew out on April 20, 2010, spewing millions of barrels of oil into the Gulf. It no longer owns any share of the lease, the statement said. An explosion on the BP-leased Deepwater Horizon drilling rig killed 11 workers, blackened beaches in five US states and devastated the Gulf Coast's tourism and fishing industries. "This landmark settlement is an important step -- but only a first step -- toward achieving accountability and protecting the future of the Gulf ecosystem by funding critical habitat preservation projects," US Attorney General Eric Holder said in the statement. The officials said the settlement did not affect the government's claims against any other defendant in the Deepwater Horizon lawsuit that was filed on December 15, 2010. Tens of billions of dollars will be at stake in the trial of the first phase of the case, set to begin on February 27 in federal district court in New Orleans, Louisiana. The federal judge is due to determine whether the deadly missteps constitute gross negligence, how much of the blame rests with each party and whether punitive damages should be imposed. BP has said it is working to reach a settlement with the US government over a host of civil fines and possible criminal charges. The British oil giant already has paid more than $6 billion to over 220,000 claimants who chose to settle with a special fund set up to provide emergency payments and a faster route to reimbursement. The massive cleanup and containment effort has cost BP $13.6 billion.